I love painting cookies also and I have the prettiest glossy frosting recipe. This makes an easy to use frosting that will dry with a nice shiny coating. 1. COMBINE powdered sugar and milk in small bowl. Stir until smooth. Stir in corn syrup and extract until icing is smooth and glossy. If too thick, add more corn syrup. 2. DIVIDE frosting into separate bowls as needed. Stir in food coloring as desired. 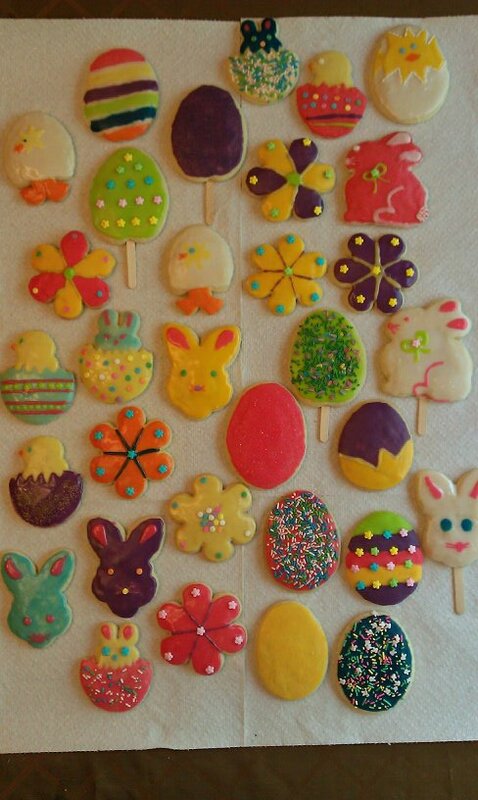 Dip or brush frosting onto the tops of cookies. Serving Size (1/36 of recipe), Calories 45 (Calories from Fat 0), Total Fat 0g (Saturated Fat 0g, Trans Fat 0g), Cholesterol 0mg, Sodium 0mg, Total Carbohydrate 11g (Dietary Fiber 0g, Sugars 10g), Protein 0g; Percent Daily Value*: Vitamin A 0%, Vitamin C 0%, Calcium 0%, Iron 0%. Here is another shiny glossy frosting recipe I have used occasionally. Click Here.